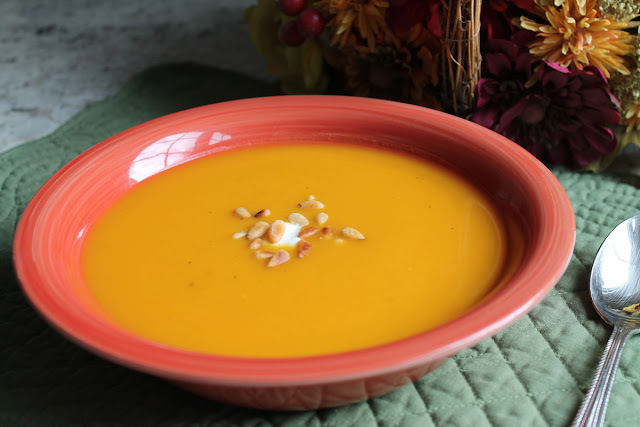 Butternut squash soup is one of my favorite fall and winter soups. It actually may be my favorite soup of all, but sometimes I think my favorite soup is whatever one I am eating that day. Over the years I've made multiple versions of butternut squash soup. The one I favor often depends on the ingredients I have on hand, the weather, or how much effort I am wanting to expend. 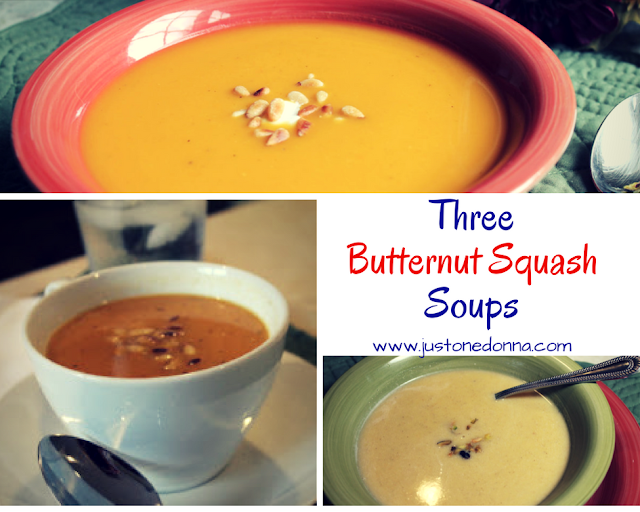 Today I'm sharing my three favorite versions of butternut squash soup. The first is quick and easy, the second is spicy, and the third is decadent. Some of my recipes for butternut squash soup take a little time to make but there are those days when I am just too busy for my usual butternut squash soup preparation. This recipe for Roasted Butternut Squash and Apple Soup is perfect for those days when you are in a hurry, and crave butternut squash soup! This recipe for butternut squash soup cuts your preparation time dramatically. Most of the approximately one hour it takes to make this soup is time you are waiting for the vegetables to roast in your oven. You don't need to watch the roasting process so you are free to multi-task while your oven does all the work. Don't leave out the apple. Use a favorite apple, either sweet or tart, for a subtle background flavor. Feel free to substitute a pear. Pears are yummy in this soup, too. If you don't have a sweet potato, go ahead and substitue one or two carrots. They work in this soup, too. Another reason to love this soup is that each of the six servings is only about 90 calories. That makes this soup a perfect addition to your health conscious menu, while still being satisfying and delicious. It will taste more like a treat than a healthy addition to your daily menu. Preheat your oven to 400 degrees F. Line a baking sheet with aluminum foil and spray with a cooking spray. Place the squash, sweet potato, apple, onion and garlic into a bowl and sprinkle with the olive oil, salt and pepper. Toss the vegetables well to be sure they are coated with the oil, salt and pepper. Place the vegetables on the prepared baking sheet and roast on the center rack of your oven for 30-40 minutes, until they are for tender. Remove the the vegetables from the oven and allow them to cool on your counter for 10-15 minutes. While the vegetables are cooling, place the pine nuts in a dry pan over medium heat on your stove top. Heat them, stirring occasionally, until you smell the aroma of the nuts, about 5 minutes. Remove the pan from the heat, tossing the nuts so they don't burn. Set the nuts aside to cool. Place the vegetables and thyme in the bowl of your blender. Add approximately 2 cups of the chicken broth and puree the mixture until it is smooth with no visible chunks. Pour the vegetable mixture into a medium sauce pan. Add the remaining chicken broth to the mixture, stirring to combine. Heat the mixture over medium heat until bubbly. Serve hot, garnished with a few toasted pine nuts for a little extra nutty flavor. When it is January and winter is showing its true colors you'll want a soup that really warms you up. When the temperature outside has plummeted, the wind is howling, and snow is on the way a steaming pot of soup is what you need. This chipotle butternut squash soup will be perfect for those cold-down-to-your-toes days. It's spicy, so add the chipotle in adobo in small amounts. Pair it with a grilled cheddar and caramelized onion sandwich for a meatless meal. Yum! First, use frozen butternut squash and you won't have to struggle with peeling and dicing a whole squash. Buy a bag of carrot matchsticks from the produce section of your grocery store and you won't need to peel and slice your carrots. Buy peeled garlic cloves packaged in bags from the produce section of your grocery store. I've never liked peeling garlic. If you have a garlic press, this is a good time to use it rather than taking the time to mince your garlic cloves. Keep pureed chipotle in adobo in tablespoon portions in your freezer so they are always ready for recipes. Just puree canned chipotle in adobo sauce using your food processor or blender. Measure tablespoon portions into snack-size plastic bags and freeze for later use. Finally, saute the vegetables, bring the soup to a simmer and cook all in one pot. The preparation is easy and the cleanup is minimal. There is no reason not to make this soup when you want to spice up your life. Saute the onion, celery, and carrots in a Dutch oven until tender, about five minutes over medium high heat. Season with salt and pepper. Add the apple and garlic, cooking for another two minutes. Stir in the chipotle in adobo, honey and chicken broth. Start with one teaspoon of the chipotle in adobe and taste until you get the level of heat you like. Bring to a boil and reduce to simmer. Taste again for seasoning and adjust as needed. Simmer for 30 minutes until the squash is tender. Using an immersion blender, puree the soup until smooth. Taste and season with additional salt, pepper, and chipotle in adobo, if necessary. Keep warm until ready to serve. Meanwhile, mix the sour cream and remaining chipotle in adobo together. Top each bowl of soup with a dollop of the chipotle cream or toasted pine nuts when serving. The last butternut squash soup is a bit more decadent and would make a nice start a special dinner, like Thanksgiving, or Christmas. The apple flavors in this soup are equal in prominence to the butternut squash flavors. It is a sweet soup, enhanced by cinnamon and nutmeg. This soup screams of fall, comfort food, and warmth as the weather turns colder. It is easy to make. The only work comes from chopping the onion, celery and apple. If you buy your butternut squash already peeled and diced you won't have to struggle with that. I used a whole butternut squash that I cut in half and roasted. That made it easy to remove the peel before adding the roasted squash to my soup. Preheat oven to 400 degrees F. If you are using a whole butternut squash, cut the squash in half. Rub the cut side with oil and sprinkle with salt and pepper. Place cut side down on a baking sheet and roast in 400 degree oven for 25 minutes, or until a knife inserted in the squash meets no resistance. If using peeled and chunked butternut squash, toss the chunks in a tablespoon of oil and sprinkle with salt and pepper. Spread on a single layer and roast until tender, about 15 minutes. Remove the squash from the oven, peel if necessary and set aside. Meanwhile sauté the apples, celery and onion in a large, heavy pot until the onion is translucent and the celery and apple are tender, about 10 minutes. Add the butternut squash, cider and chicken broth. Bring to a simmer and cook for 20 minutes. Add spices and season with salt and pepper. Blend with an immersion blender, or in a blender at high speed until smooth and creamy. If using a blender, you'll want to cool the soup first. Stir in the heavy cream. Garnish with chopped pistachio nuts, if desired. There you have it. Three butternut squash soups for whatever mood you are in. They are all yummy. You can't go wrong.